While off-the-shelf USB modems can be used to dial calls and detect caller ID, they are not designed for call monitoring or accounting. They do not report real time call status needed to determine call duration, nor detect digits pressed and outbound calls dialed from the telephone line itself. 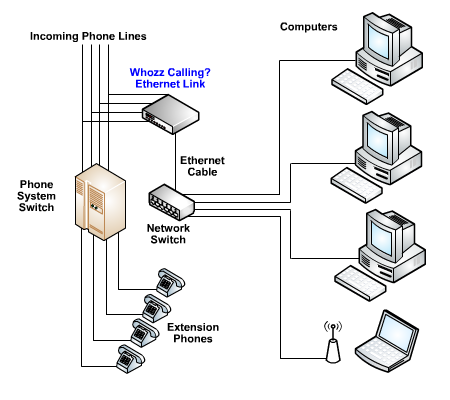 In addition, each USB modem must be located near a computer and can only monitor a single phone line making them less practical for multi-line business applications (including PBX systems). To address these limitations, Phone Amego supports multi-line Caller ID and Call Monitoring hardware made by CallerID.com. These devices attach directly to your Ethernet LAN and can monitor up to 8 phone lines per unit. Additional call monitoring units can be added to support more phone lines as needed. When a phone switch is present, the Whozz Calling? unit would be connected to the incoming lines before they terminate at the phone switch. A telephone technician would simply connect a parallel set of phone lines to the Caller ID unit. The Whozz Calling? connects to the local area network with a standard Ethernet cable. Since the Whozz Calling? unit is connected in parallel with the incoming phone lines, it acts as a listening device for Caller ID and other phone call information. The phone switch rings the extension phones in the office and the Caller ID is captured by the unit just after the first ring. The Whozz Calling? unit immediately sends data to all the computers attached to the local area network. Any computer loaded with Caller ID software picks up this information and displays it.